It’s a far different Waikiki that surfing pioneer Duke Kahanamoku oversees now, and hopefully he would be pleased, reports western editor, Ted Davis in this week’s digital edition of Travel Courier. The famous spokesman of the surf, whose statue borders the beach, would see that the last remains of a rustic Waikiki are long gone. But he might also observe that the more gimmicky, down market aspects of Hawaii’s top destination have been largely dismissed, as a wave of change sweeps down Kalakaua Avenue and through the rest of Waikiki. Presumably, he would be happy to see that this transformed destination provides a more polished setting for those things that represent Hawaiian culture. And Duke still has pride of place at the southern end of the beach. His tall likeness with outstretched arms still stares inland in a sign of welcome to the famous strand. “There is a new generation of visitors coming and all the changes here have brought a new life to Waikiki,” said Monica Salter, the VP of corporate communications for Outrigger Enterprises Group. She pointed to the innovative Waikiki Beach Walk open air mall and entertainment venue as one of those key developments. 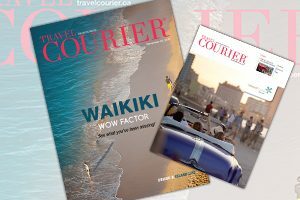 To discover all the changes in Waikiki, check out this week’s cover story in Travel Courier.